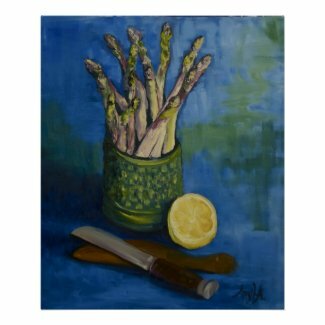 Fresh steamed asparagus is one of the delights of springtime in western Europe. With a slice of fish, and not too much sauce (this recipe makes enough for 4-6 servings), it’s a wonderfully healthy meal that can be ready in 10 minutes! 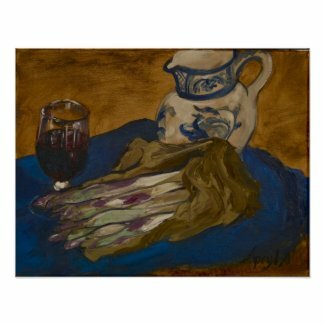 Add a glass of dry white wine—such as a Cassis-- and you’re a world-class chef…. 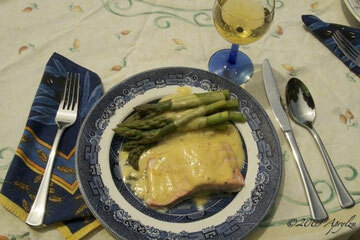 Steam or microwave your salmon and asparagus for about 10-15 minutes. Meanwhile, cut 225g (1 C) butter into 25g (1-2 T) chunks; set one of those chunks aside. Melt the remaining 200g butter and set that aside, too. Prepare a double-boiler—that’s a metal pan that fits inside a larger cooking pot of simmering water. You want to keep your sauce from direct contact with the heat source, hence what the French call du bain-marie. According to wikipedia, the discovery of the bain-marie is attributed to Albert le Grand (1193-1280), an alchemist, who makes reference to Marie the Jewess, an early inventor of laboratory utensils. So, when the water in the base pot is simmering nicely, remove it from the heat. Place the smaller pan inside, and in that, whisk for 1-2 minutes. Put the pan back over a low heat; add the reserved chunk of butter. Keep whisking over the lowest possible heat—you might even want to remove it from the heat source entirely. The mixture should be smooth and creamy. 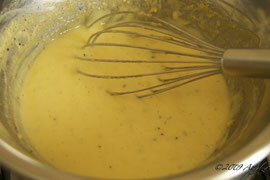 Gradually add the reserved melted butter, whisking it until the sauce is thick. If the sauce curdles during cooking, remove it from the heat immediately, and whisk in 1 T boiling water. Season this sauce with fresh herbs and a tsp mustard, and serve it over cold cooked potatoes, and you’ve got a salad!